The first QB in NFL history to pass for 5,000 yards or more in a single season, Dan Marino is a nine-time Pro Bowler who led the Miami Dolphins to the playoffs in 10 of his 17 seasons, including an appearance in Super Bowl XIX. The University of Pittsburgh alum held more than 40 NFL single season and career passing records at the time of his retirement in 2000. 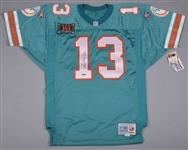 We have a collection of signed and verified Upper Deck Authentic items from the 2005 HOF inductee, with a signed Dolphins jersey, a signed and framed limited-edition Wheaties box and a dual-signed and framed Sports Illustrated cover with fellow HOFer Joe Montana. The jersey was produced by Wilson with labeling over the lower front including “48” sizing, with tackle twill “13” over the front, sleeves and verso, with Dolphin logos rubberized over each sleeve. 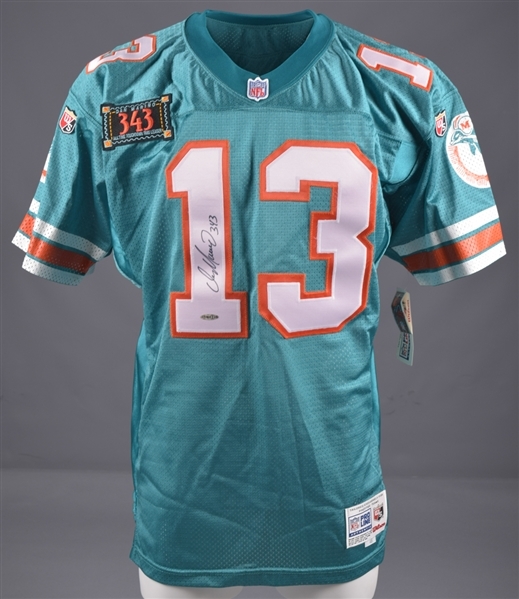 Marino has signed the front “1” in black marker, with the signature bleeding into the material just slightly. There is also a “343” patch, as he was the all-time touchdown pass leader at 343 when this jersey was made, along with a UDA hologram numbered “BAA88320”. 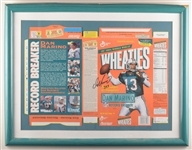 The Wheaties box is from 1996, with Dan Marino and “Record Breaker”, with Marino signing near his image in black marker, with no issues for the signature. Hand-numbered “152/5000”, a hologram has been added from UDA numbered “BAB48250”, framed to full dimensions of approx 20” x 26”. The box appears to be in flawless high-grade, with some heavy wear to the cheap frame including peeling of the faux-veneer material. The dual-signed Sports Illustrated cover appears to be a copy of the Jan 21st 1985 issue, with both Marino and Montana featured on the cover, with each signing over their respective image. Set in a cheap frame (plastic cover not glass) to full dimensions of 12” x 15”, both signatures display well, with a hologram from UDA numbered “BAD09877” placed within the lower right.